Hi, my name is Bonnie Loving and I’m a horse-aholic J. I grew up on the front range in Colorado. I was a horse crazy wild child. I took jumping lessons for several years then moved on to western riding. I finally adopted my first mustang when I was in high school. We were a perfect match, young and wild. It was an amazing experience growing up with Ringo (my mustang). He is my best friend, the one who I would run to when I had / have a bad day. Anyway I moved to Fort Collins to attend the Colorado State University. I majored in Forest Management. Throughout college I worked for Rocky Mountain National Park doing wildland firefighting. It was a very eye-opening experience; just to see how big of a role fire plays in natural resources. I won’t get into it, but bottom line fire is very important, as well as managing your forests, the do nothing approach, which is becoming very popular, is going to result in unhealthy forests and catastrophic fires. I acquired another BLM mustang during college. His name is Cowboy, he is from Nevada, and he is the boss. Doesn’t matter where I move him, he will take charge of the herd and claim the mares. He and Ringo are best friends, I could NEVER separate them. After graduating college I moved to Mancos, where my parents live. Got a job with the state forest service doing forest inventory analysis. I loved the research project, thought it was very beneficial and important to forest managers, BUT I couldn’t stand how inefficient the government was with their money and time, and how arrogant the people were. So I quit and got a job managing invasive weeds in this southwest area. My biggest contract was with the Forest Service, the ARRA program. Basically I would go in a few years after a thinning project took place and I would map the invasive weed populations and eradicate them. I never knew how big of a problem invasive species were following a forest management operation. That’s something they should teach in the forest management program in college… It’s important. That brings me up to today. I don’t work in the invasive weed management anymore. I need a break from the chemicals. It tends to mess with my reproductive system, and I’m trying to get pregnant. My significant other is Edward Anderson, he works for Neibors drilling company, through Kinder Morgan. He is the derrick man, who sits 100’ up on this little board pulling in pipe. He is a hardworking man. My two step kids are Ashlynn and Kayden. Ashlynn will turn 3 in December (2014), and Kayden will turn 7 in January (2015). When I graduated college I started making tables here and there for myself and family. 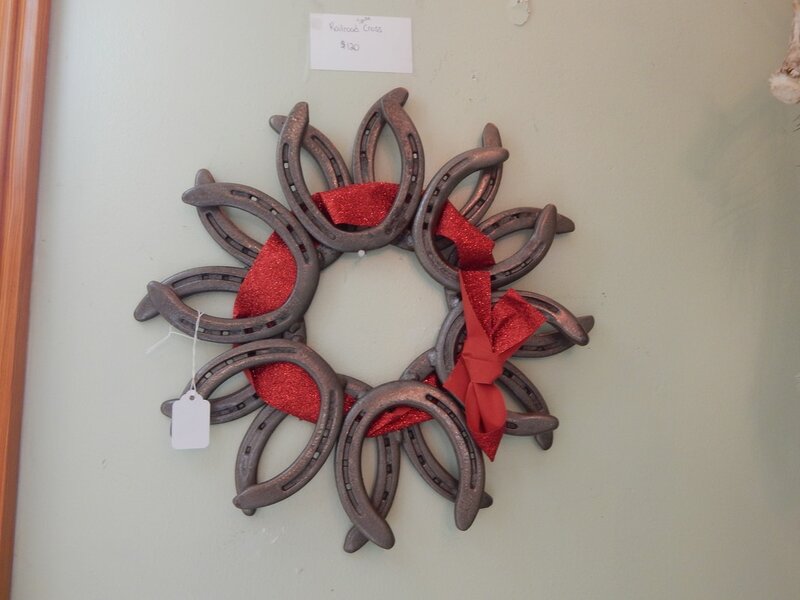 I loved the rustic look and horseshoe look, but could never afford it. That’s why I started just making it myself. Now that I’m not working in managing invasive weeds and refusing to work for the government I’m enjoying doing what I love doing. 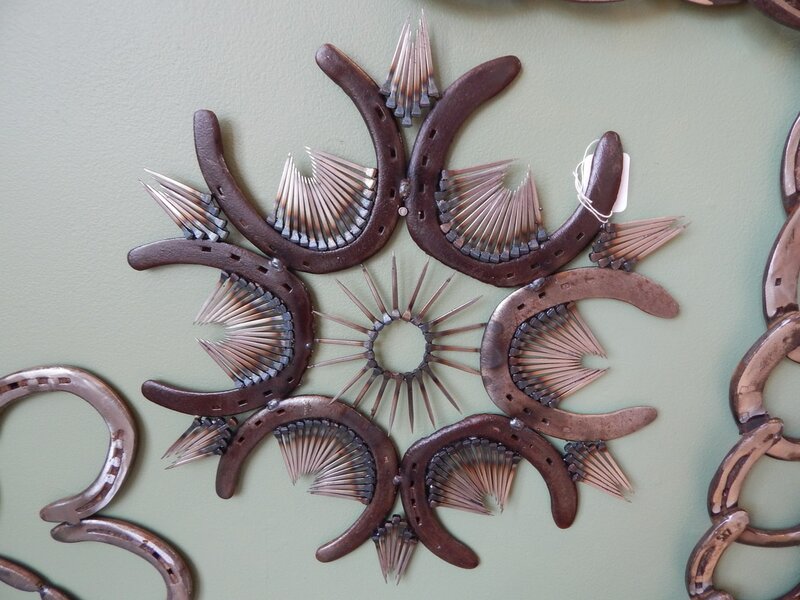 Making things out of used horse shoes, wood, antiques, etc… Hopefully I can make a living out of it, but I’m just going with the flow.